We’d love your help. Let us know what’s wrong with this preview of Our Celebración! by Susan Middleton Elya. It's a sunny day and everyone is headed to the main plaza for the start of the town parade and summer celebration. Follow along the parade route with a family of six as the festivities unfold. There are people riding motorcycles, bicycles, tricycles, and unicycles. Firefighters spray water on hot spectators. Bands of musicians playing clarinetes, saxophones, flautas, trump It's a sunny day and everyone is headed to the main plaza for the start of the town parade and summer celebration. Follow along the parade route with a family of six as the festivities unfold. There are people riding motorcycles, bicycles, tricycles, and unicycles. Firefighters spray water on hot spectators. Bands of musicians playing clarinetes, saxophones, flautas, trumpets, and more march by. Lemonade, watermelon, tacos, and ice cream are consumed. The corn princess waves as her float goes by. And when a quick rain shower comes, the spectators duck for cover, and are rewarded with a colorful rainbow. Back in the main plaza at night, the festivities end with sparkling fireworks. Pop, pop, pop! Bon, bon, bon! To ask other readers questions about Our Celebración!, please sign up. Be the first to ask a question about Our Celebración! Elya is always good for a golden storytime book. Love Aranda's sunny illustrations! This is an interesting blend of both English and Spanish. The lines rhyme and sometimes an English word rhymes with a Spanish word and vice versa. I don’t remember seeing that done before, and I found it very interesting. There is a glossary in the back for all of the Spanish words used. The bright, festive illustrations on the cover are immediately eye-catching and inviting. To the reader’s delight, the bright full-page color illustrations continue throughout the book. The text is written in an upbeat cadence that lends itself well to a lesson about rhythm and rhyme. The majority of the text is written in English, however, Spanish terms, mostly nouns, are woven throughout the text in a way that lends itself well to the pervasive rhyme scheme. The text could serve to facilitate The bright, festive illustrations on the cover are immediately eye-catching and inviting. To the reader’s delight, the bright full-page color illustrations continue throughout the book. The text is written in an upbeat cadence that lends itself well to a lesson about rhythm and rhyme. The majority of the text is written in English, however, Spanish terms, mostly nouns, are woven throughout the text in a way that lends itself well to the pervasive rhyme scheme. The text could serve to facilitate a classroom discussion about using clues to determine the meaning of unfamiliar words. The reader can use context and pictures clues to attempt to determine the meaning of the Spanish words. At times the pictures allow for a “Where’s Waldo” type of interactivity as readers seek the details in the picture that explain an unknown word. Overall, this picture book is joyful, playful, and would be a delightful addition to a preschool or early elementary picture book collection. This book was given to me to read and review by Lee & Low Books as part of the annual Multicultural Children's Book Day event. Multicultural Children’s Book Day 2019 (1/25/19) is in its 6th year and was founded by Valarie Budayr from Jump Into A Book and Mia Wenjen from PragmaticMom. Our mission is to raise awareness of the ongoing need to include kids’ books that celebrate diversity in home and school bookshelves while also working diligently to get more of these types of books into the hands of young readers, parents and educators. MCBD2019 is honored to have some amazing Medallion Level and Author Sponsors on board. TWITTER PARTY Sponsored by Make A Way Media: MCBD’s super-popular (and crazy-fun) annual @McChildsBookDay Twitter Party will be held 1/27/19 at 9:00pm. E.S.T. Join the conversation and win one of 12 five book bundles and one Grand Prize Book Bundle (12 books) that will be given away at the party. We will be giving away a prize every 5 minutes! 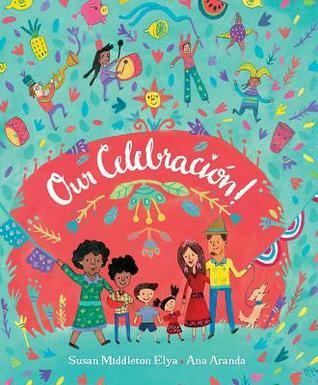 A community heads to a celebration together in this vibrant picture book that offers a mix of Spanish and English. The celebration features a large parade with fantastic floats, marching bands, fire engines and much more. There is plenty of delicious food to try and refreshing drinks to sip. When the rain begins, the fun doesn’t stop, though everyone celebrates when the sunshine returns bringing with it a celebratory rainbow. 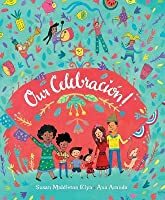 Elya does a marvelous job of offering Spanish words for children to lea A community heads to a celebration together in this vibrant picture book that offers a mix of Spanish and English. The celebration features a large parade with fantastic floats, marching bands, fire engines and much more. There is plenty of delicious food to try and refreshing drinks to sip. When the rain begins, the fun doesn’t stop, though everyone celebrates when the sunshine returns bringing with it a celebratory rainbow. Elya does a marvelous job of offering Spanish words for children to learn. Almost all of them can be figured out from the context in the poem. I appreciate that she uses the Spanish words for many of the rhymes, rather than burying them in the center of the lines. This makes them all the more enjoyable to read aloud and great fun to figure out. The book will also welcome Spanish-speaking children and allow them to decode the English as well. It is a cleverly built picture book. Aranda’s illustrations are filled with brilliant colors of sunshine yellow, deep purples, bright blues, and hot pinks. They show a diverse community celebrating together with big smiles, lots of fun and whimsical parade participants. #Ownvoice #Spanish #vocabulary A parade is presented with 50 Spanish words with rhyming text. Engage with people, sights, weather, and experience a celebration. Bright pictures and rhyme make this a great text. Nice internal rhyme scheme with tons of Spanish vocab and a glossary at back. A little too much to read to a child who is not at all bilingual, but for even a beginner Spanish language learner, the words would be easy to decipher. Colorful rhyming book that includes a helpful glossary and pronunciation guide for the words in Spanish for people like me. I think it would be fun to read with a class and have the students predict what the Spanish words mean. The book revolves around a day of celebration. It's told in a mix of English and Spanish words. Terrific way to introduce both languages. Glossary of the Spanish words included at the end of the story. Would be great for bilingual storytime. Imaginative and original, at least to me. An interesting blend of English and Spanish. There might be a place for this as a mentor text in middle grades or middle school. Fun and festive, I am always impressed how smoothly her books read aloud even for non-Spanish speakers. Recommended for ages 3-6. A town celebrates. Text is infused with Spanish words, with a glossary in the back with definition and pronunciation. Fantastic bi-lingual picture book with beautiful illustrations. This was a really cute book , full of Spanish words. A great bilingual book with most English sentences ending with a Spanish word. This would make a great bilingual storytime book.